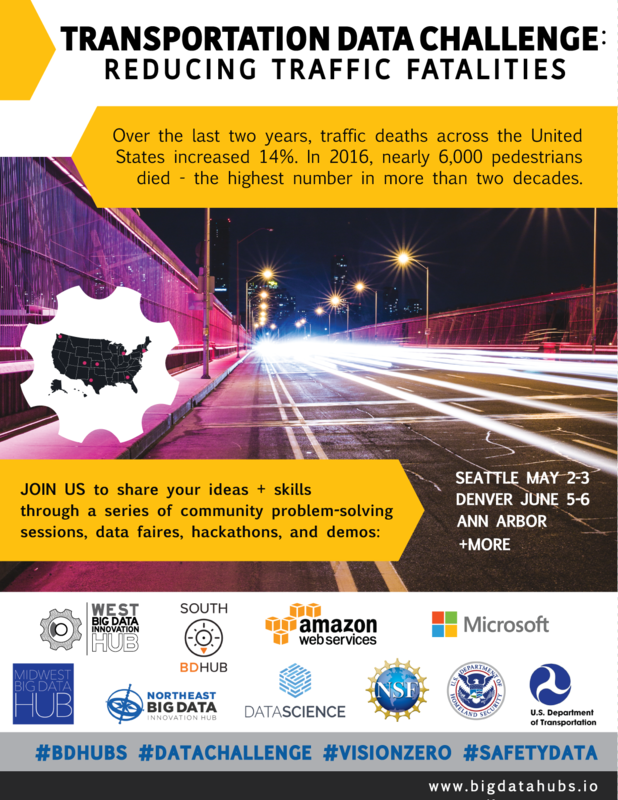 The four Big Data Regional Innovation Hubs announce the Transportation Data Challenge, a series of community problem-solving sessions, data faires, hackathons and demonstrations to be held in collaboration with the U.S. Department of Transportation, Amazon Web Services, Microsoft, Data Science Inc., and a growing community of partners. The challenge will kick off a nationwide effort, led by the Big Data Hubs, to use data to reduce traffic fatalities. In the last two years, traffic deaths have increased by 14 percent across the country, and nearly 6,000 pedestrians died from traffic-related injuries in 2016. A launch event will take place May 2 and 3 in Seattle and follow up events and workshops are scheduled forJune 5 – 6 in Denver and in Ann Arbor, MI (date to be announced). A National Transportation Challenge breakout will be held Sept. 13 – 15 in Atlanta as part of the MetroLab Network Meeting. Challenge teams will be able to attend the MetroLab conference and give updates on their progress. Additional events will be scheduled in other cities and opportunities to participate online also will be offered. To learn more and receive updates on activities, visit the Transportation Data Challenge website. To take part in our conversations on Twitter, use the hashtags #BDHubs, #DataChallenge #VisionZero and #SafetyData. To view the Transportation Data Challenge flyer, click here.